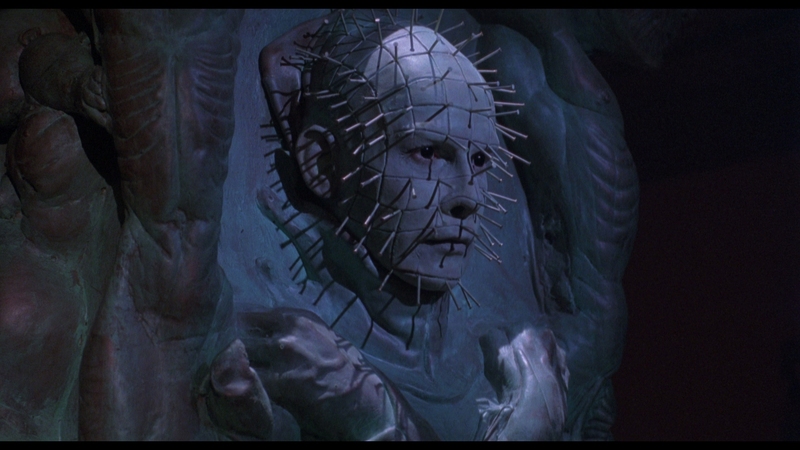 For half of Hellraiser III, franchise staple Pinhead spends his time stuck in a sculpture. It’s the best part. Pinhead isn’t a killer – he’s a morbid presence. That doesn’t sell action figures or t-shirts though. Once free of confinement, Hellraiser III shamefully reduces a stalking, eerie horror character into late Nightmare on Elm Street Freddy Krueger. The one liners, the body count, the gory kills; Hellraiser is dead the second this movie starts. 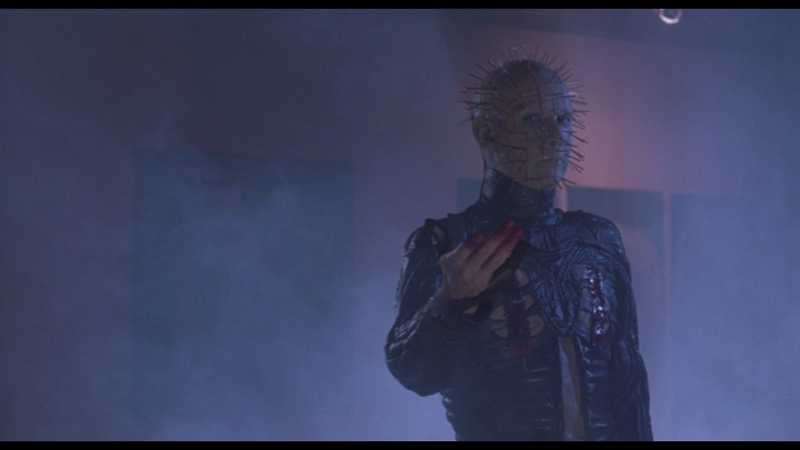 An absorbing set-up, sloppy and grotesquely derivative as it seems, repositions Pinhead as a Satan parallel. 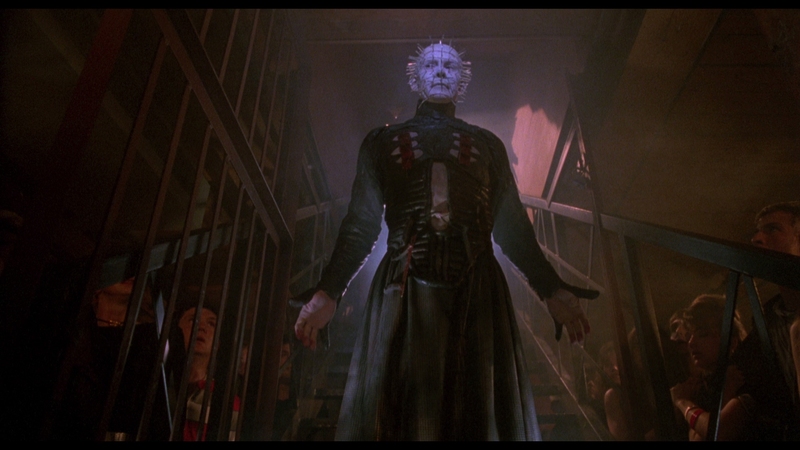 It’s bridging the narrative gap missing from Hellbound: Hellraiser II. Immobile, Pinhead offers temptation, using weak moral constitutions to seduce people to his will. He’s tantalizing. 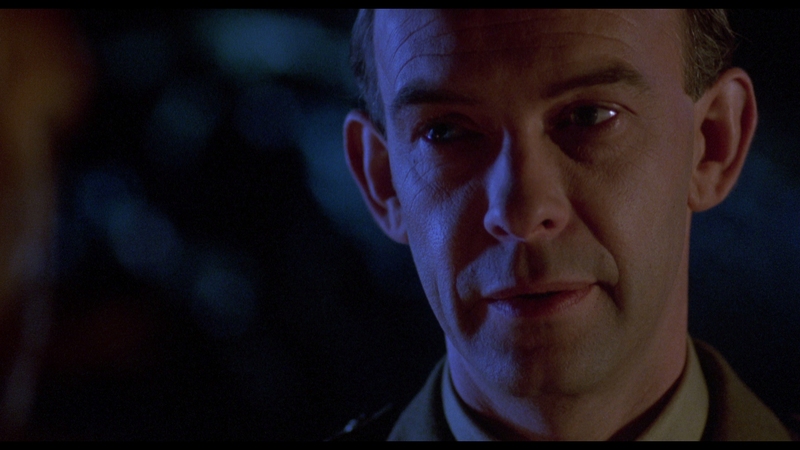 Doug Bradley’s stellar verbal accentuation completes the illusion, a suitable, even acceptable progression of the character. Elsewhere, Hellraiser III breathes ‘90s, caught in the genre bridge from the splatter splendor of the ‘80s to the post aware-Scream category. Antagonist J.P. Monroe (Kevin Bernhardt) doesn’t equate to anything other than jerky musclehead awaiting an audience-satisfying death. Terry Ferrell’s wanting performance as a snoopy reporter meets Hellraiser’s quota for protagonist women in the absence of Kirsty (Ashley Laurence), if little else. Poor Paula Marshall as an exploitable street kid dates Hellraiser III more than the twisty camera work. It all nearly works, the pieces glued together around a now starring Pinhead. The choice isn’t audacious, rather predicated by Jason, Freddy, and Micheal Meyers as their films either took on more of their personas. Pinehead’s escalation, particularly when under the wing of a new distribution studio, was inevitable. Hellraiser III is merely a follower. That’s where it’s wrong – Hellraiser cracked the horror film, unique, deceptive, cruel, and engrossing. Two films later, it’s explosions, mouthy wit, and miserable visual effects. In come the chains and meat hooks, but not for sultry set dressing; now they’re to Pinhead as a machete is to Jason. 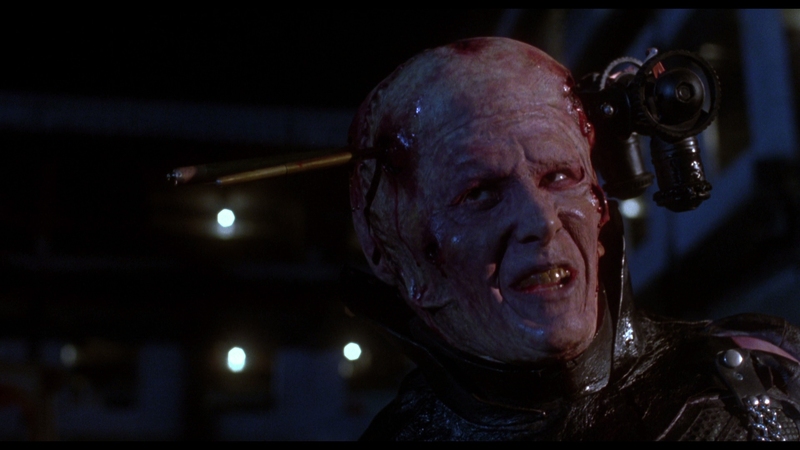 If not Pinhead, then hokey monsters who pierce brains with camera lenses or shoot CDs from their midsections. 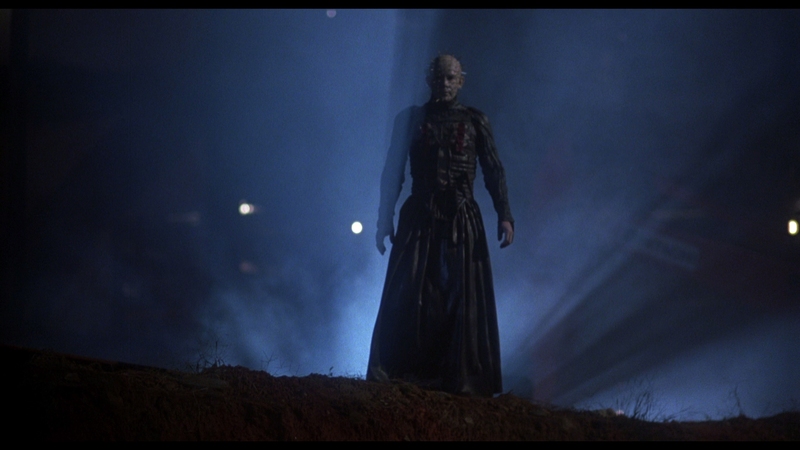 Hellraiser III’s back half is so bland and archetypal as to defeat the series it’s part of – if only the next six sequels didn’t do the same but worse. Clive Barker’s creation slumps over dead the second lore is abandoned. Pinhead turns mobile and physical, merely something for kids to lust after as they scan R-rated treats when they’re not supposed to. Although tight close-ups reveal exceptional detail, the muddy mid-range leaves a bounty of problems to discuss critically. Either filtering or low resolution is to blame, and the difficulty in sorting it out comes back to the plethora of other issues. The lighter grain of the Scarlet Box edition isn’t praise. Some early digital effects, no fault of Arrow but rather the distracting low resolution when in use, are equivalent to a DVD. There’s also a strange, even unique concern with fringing. The image doesn’t line up, as if watching for 3D, but without the glasses. While seeing double is a rarity (four shots, maybe) it’s there and apparent. Colors skew warm, tinted with a slightly digital slant. Flesh tones take a heavy hit. At least black levels offer great performance. Contrast isn’t as heavy, limiting dimensionality, if by design. 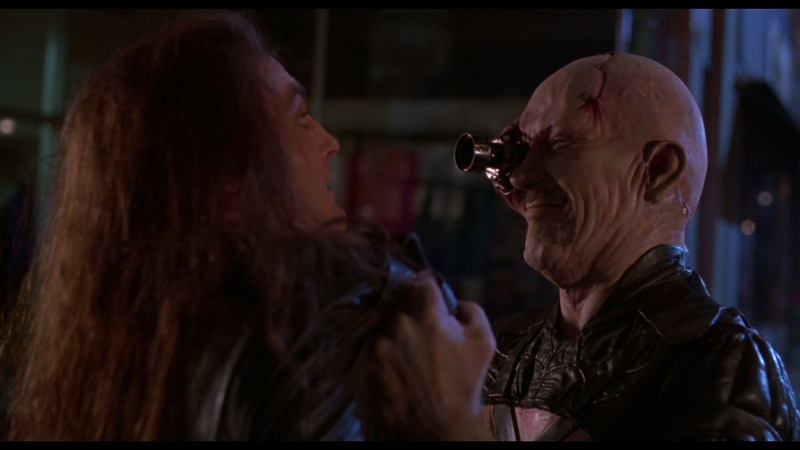 Hellraiser III falls on the dimmer side of things. At least Arrow’s encode handles what’s here, offering pure grain and no compression problems. The print used doesn’t show any damage, even in some effects-heavy shots. Only offered in PCM stereo, the track holds a dubbed quality to the voice work. Otherwise, the limited score won’t carry itself too loudly, dipping under sound effects and losing itself in the mayhem. At least the stereo effects reach an extreme, spread across that front soundstage with strong exaggeration. It’s arguably too much, if not inaccurate. Dialog, action, and ambiance all reach a specific channel. 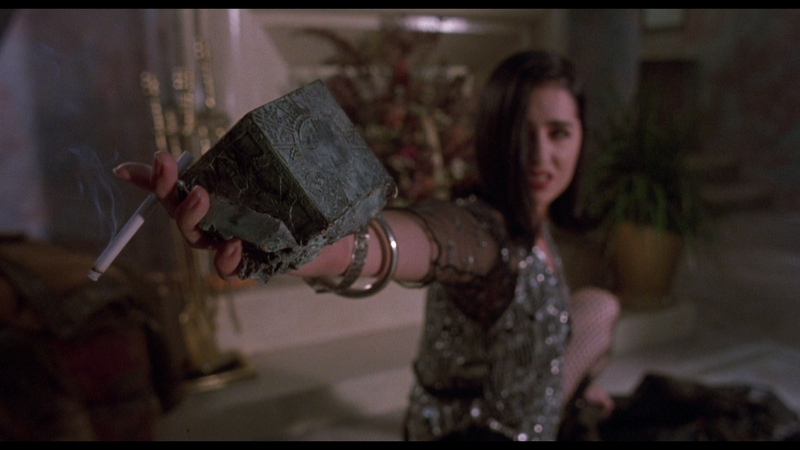 The Story of Hellraiser III comes first, 32-minutes of info on planned scripts and studio juggling. Interviews with star Paula Marshall, director Anthony Hickox, and Doug Bradley each run near 14 minutes. Awesome FX dailies (23:49) hold outtakes and unfinished shots, an interesting bonus. 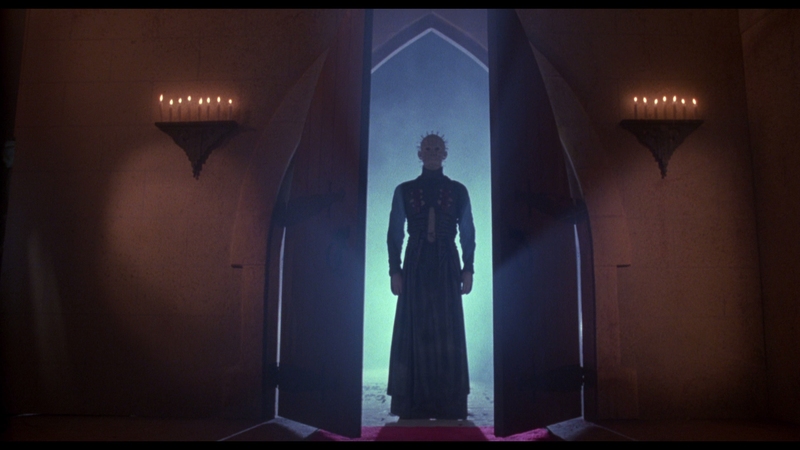 Two commentaries come in as the final piece, one with writer Peter Atkins on the theatrical cut, the other with Doug Bradley and Hickox on the unrated version (pieced together with Laserdisc footage). Note Arrow’s Scarlet Box comes with a fourth disc, playing host to two Clive Barker short films, an interview with author Dave Gatward on Barker’s books, a 30-minute pitch (of sorts) for a Hellraiser TV series (with an optional director commentary), and a documentary. Hellraiser: Evolution runs 48-minutes, scanning the whole series. Good stuff. Part of Hellraiser III tries to capture the morbid mythology of its predecessors, but slowly loses the fight to more commercial elements. 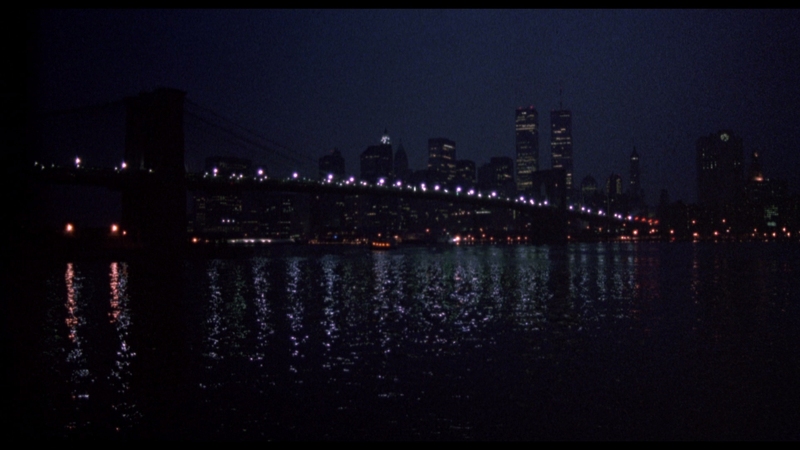 Click on the images below for unaltered, full resolution screen captures taken directly from the Blu-ray. Patreon supporters see our screen shots first, view our entire library in .png format, and gain fast access to 22 Hellraiser III exclusives for as little as $1, perfect for custom cover art, film study, or other applications.